Wichita, KS: Kansas Collegiate League Baseball is pleased to formally welcome three established franchises from the renowned Jayhawk League. The Hays Larks, Liberal Bee Jays, and Dodge City A's. The KCLB and former Jayhawk league leaders have come to an agreement to merge into one quality, competitive driven league. The KCLB will split into two division's hosting the Jayhawk West Division. The vision for a league with the top teams in Kansas competing all summer, has come to fruition. The KCLB will now be composed of, The Wellington Heat, Kansas Cannons, Hays Larks, Liberal Bee Jays, Dodge City A's, Clearwater Outlaws, Park City Rangers, Valley Center Mud Daubers, McPherson Pipeliners, and Kansas Curve. The current KCLB makeup is the most competitive makeup in the state of Kansas. The Liberal Bee Jays have 5 NBC Titles, seven 2nd place finishes. The Wellington Heat, have 2 US Open world titles and one NBC title, a 2nd place finish, and have placed top 5, fourteen times. The Hays Larks have five 2nd place finishes, and fourteen top 5 finishes. The Park City Rangers have one top 10 finish, three top 15 finishes, and 2 top 20 finishes. The Kansas Cannons have three top 10 finishes, and two more in the top 15. The Dodge City A's have one top 10 finish and represented the Jayhawk last year in the NBC. The Valley Center Mud Daubers have one NBC appearance in 2017. Nate Robertson issued the following statement on the future of the Kansas Stars at the NBC World Series. 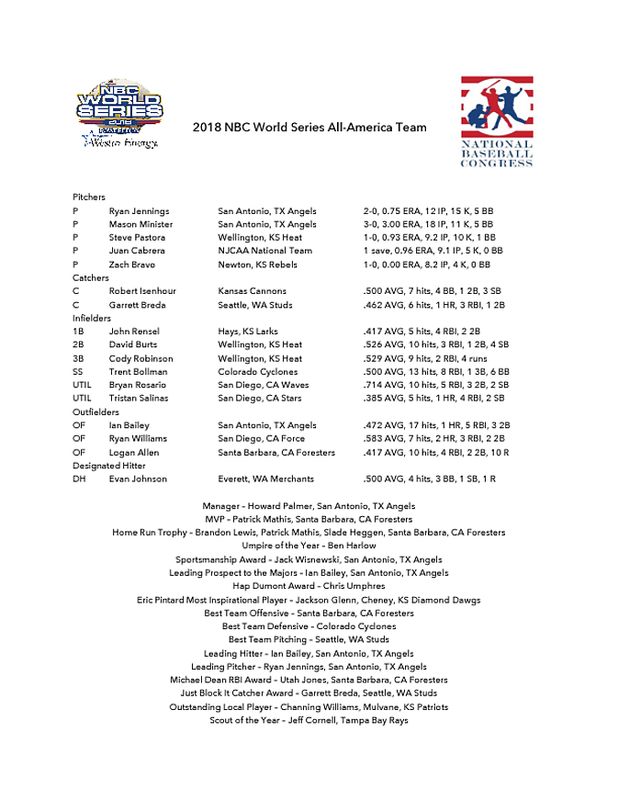 "On behalf of myself, Adam LaRoche, and the rest of the Kansas Stars players and families, we would first like to thank the many individuals and companies who made the last two years such a memorable NBC World Series experience. As baseball players, we have a passion for the game and a desire to compete, in spite of our age. The World Series offered that competitive platform that allowed us to get back on the field and play meaningful games again. Playing games that matter was the driving force that brought this group of players together, providing us with the opportunity to give back to various Wichita charities through autograph signings, donations, and partnering with the Wichita Wingnuts for our first annual Hit-a-Thon. for this town and has put Wichita front and center through major media outlets and nationally televised ESPN programming. We are especially thankful to our number one sponsor and home base, the Kansas Star Casino, that bent over backwards to accommodate us. this team to leave our town, going forward we will now have to explore the other options for the Stars. years to come. Thanks again to all of those who believed in this vision; it was our “field of dreams” moment and we hope it made lifelong memories for all who witnessed it."